Team Daytona’s BEACH House offers an aging-in-place design that can be fully ADA compliant with only minor cosmetic changes, allowing the homeowners to stay in the home as long as they wish. Passive, energy-neutral technology is incorporated throughout the house to perform in Florida’s hot humid climate. Blomberg (www.blombergappliances.com), an ever-expanding line of contemporary European design and energy efficient products for builders, designers and architects of multi-unit buildings, is providing appliances for the home. “Through the BEACH House, we hope to show our community that comfort and affordability do not have to be sacrificed to live sustainably,“ says Daytona State graduate Stephanie Kowalak, the team’s architecture manager. 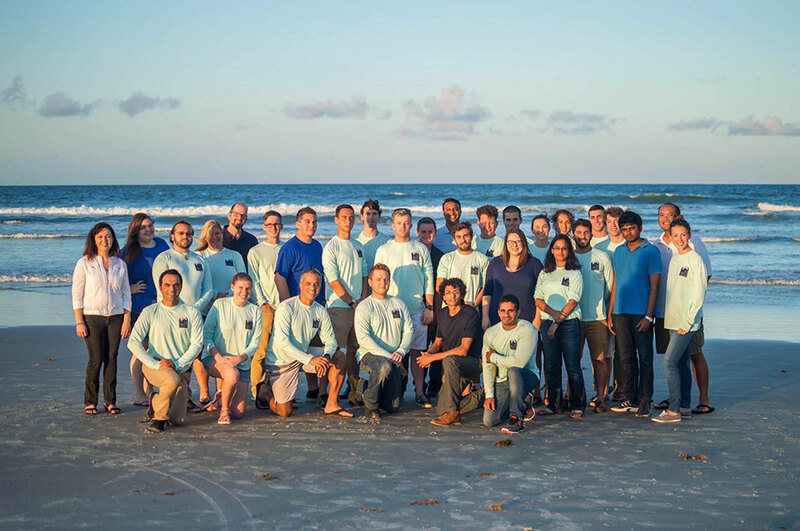 Approximately 40 ERAU engineering students and 15 Daytona State students have been involved since the design was accepted into the Solar Decathlon competition in early 2016. The home is being built at Research Park East, an annex of Embry-Riddle. “The students are benefitting from every aspect of the on-site experience, from team building, to developing an interest in sustainability, to learning about clean energy job opportunities and more,” said Embry-Riddle graduate student Jenna Beckwith, Solar Decathlon team leader for mechanical engineering. The 950-square-foot home is centered by a galley kitchen that leads to an eastside dining and living area, while the west end consists of two bedrooms and one bath. Adding outdoor living space is a large deck on the south with a hydroponic garden, and a shaded front porch on the home’s north side. With its coastal contemporary look, the home brings in the outdoors through a neutral palette of sand, white and earth tones, with pops of blue and coral. A 10 kw photovoltaic battery powers the entire house, helping to offset the need for power from the electric grid. A cross ventilation system in the vaulted ceilings allows beach air to enter the home and refresh its occupants, while reducing energy consumption. The automatic system measures indoor and outdoor temperatures, and if conditions are right, opens strategically placed upper windows to let heat out or cool air inside the home. Ductless HVAC system for more accurate climate control and a greater aesthetic appeal; up to three different zones allow for specific temperature for an individual room without having the whole system running at one temperature. The winner is the team that best blends design excellence and smart energy production with innovation, market potential, and energy and water efficiency. Team Daytona will receive prize money of $100,000 for its participation, and the overall winner will receive $300,000. “We’ve done our research, put a lot of time into the design, and as a result, we believe our team will do well in all 10 competition events,” Beckwith said. These include architecture, market potential, engineering, communications, innovation, water, health and comfort, appliances, home-life and energy. After the competition, the BEACH House will be on display at the International Builders Show in January 2018, and then may be sold to maintain the Embry-Riddle Aeronautical University building efficiency program. The $400,000 budget for the Solar Decathlon project was offset by a $90,000 contribution from Embry-Riddle, as well as fundraising, in-kind donations and support from industry partners. When Blomberg came forward as a Solar Decathlon sponsor, Team Daytona Beach discovered the company had won the 2017 ENERGY STAR® Partner of the Year award and that their appliances were among the most energy efficient in the market. Blomberg is part of Beko US, Inc., which was founded in June 2016 and opened a distribution center in Bolingbrook, Ill.